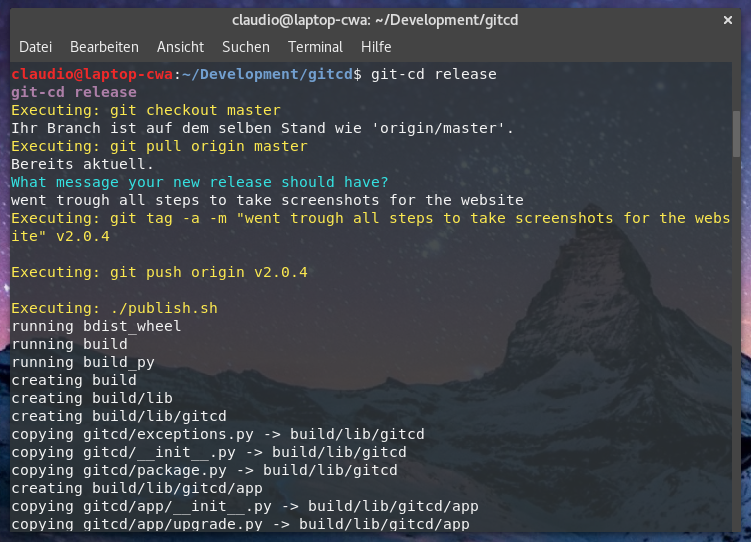 gitcd is a little helper for continuous delivery workflows, using git as scm. 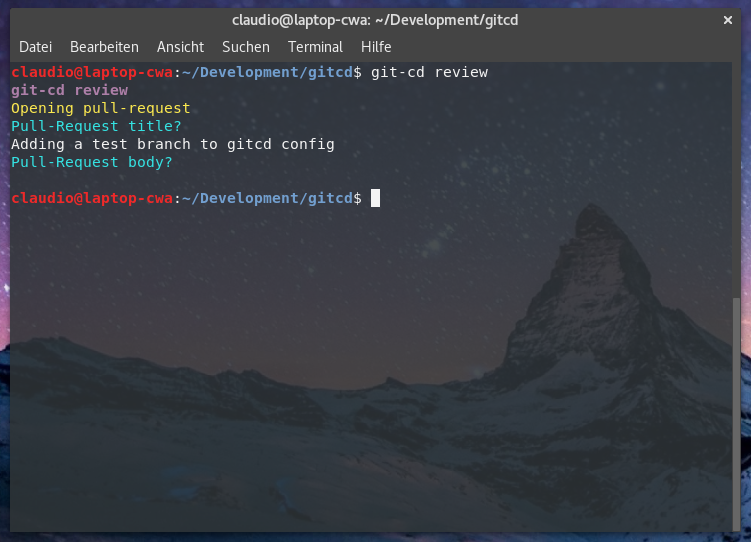 Gitcd is written in Python3. Most systems still deliver with Python2 as default. 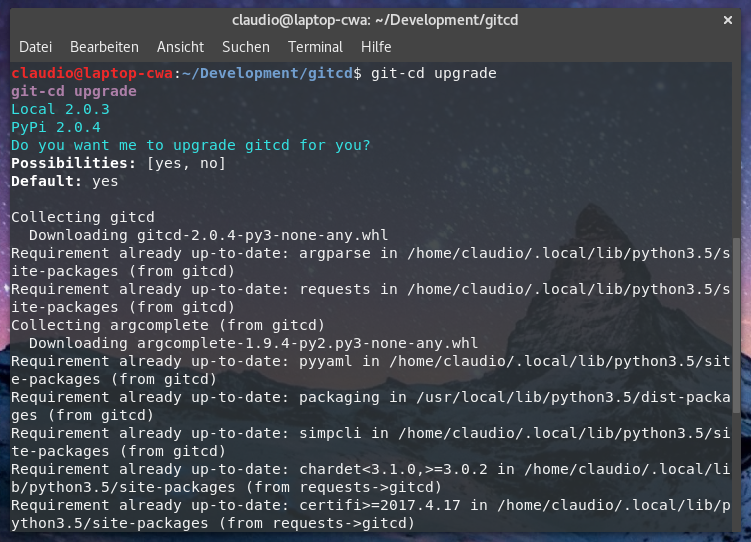 You need to install Python3 in order to run gitcd properly. 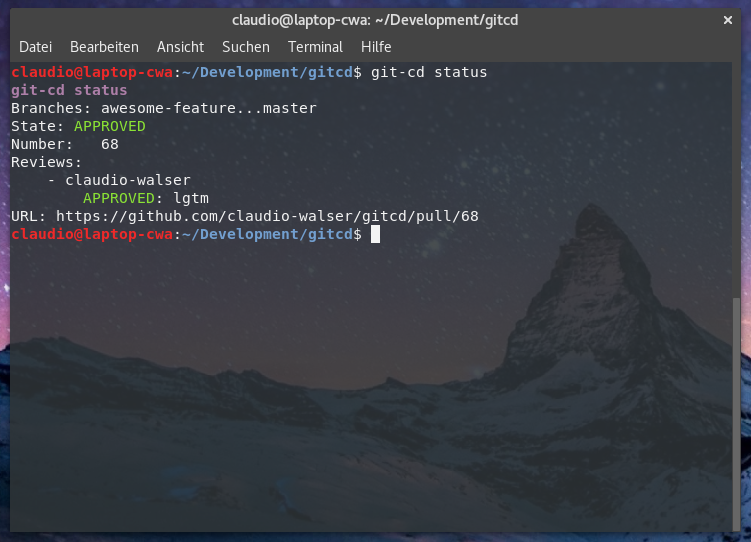 Now you are ready to install gitcd itself, which is quite easy using pip. If the command “git-cd” or “git cd” is not available now, you probably need to add the pip binary path to your $PATH variable. Open ~/.bash_profile in your favorite editor and add the following lines at the end of the file. Open ~/.profile in your favorite editor and add the following lines at the end of the file. Gitcd supports argument completion, to activate it execute the following steps. Under OSX it isn’t that simple unfortunately. Global completion requires bash support for complete -D, which was introduced in bash 4.2. On OS X or older Linux systems, you will need to update bash to use this feature. Check the version of the running copy of bash with echo $BASH_VERSION. On OS X, install bash via Homebrew (brew install bash), add /usr/local/bin/bash to /etc/shells, and run chsh to change your shell. You are now ready to activate global argcompletion for python with the following command. 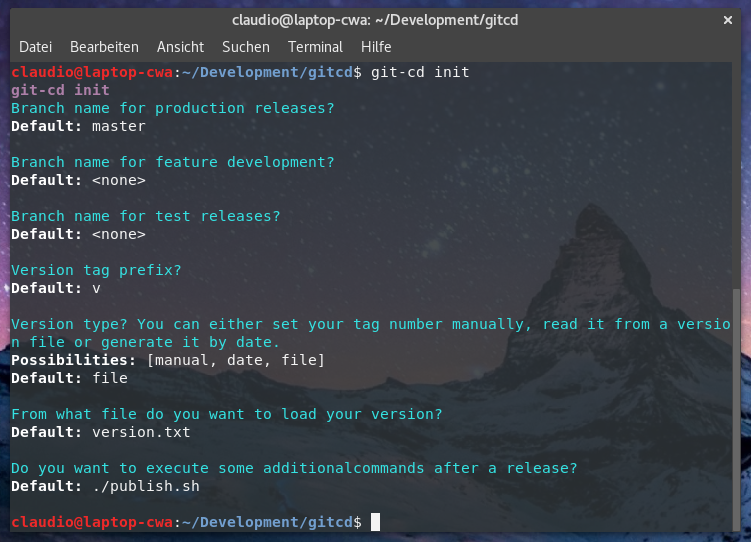 For convenience, you can call gitcd as a git sub command as well as directly. 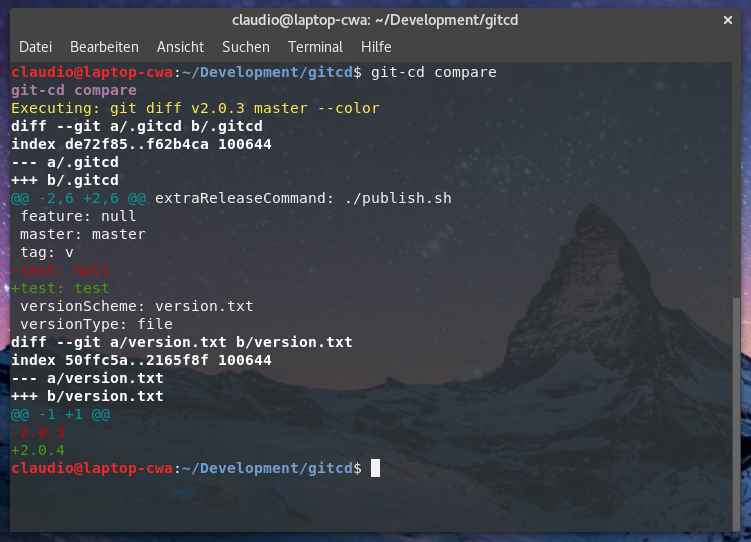 Therefore, you can replace “git cd” in any of the following commands with “git-cd” if you like it more. 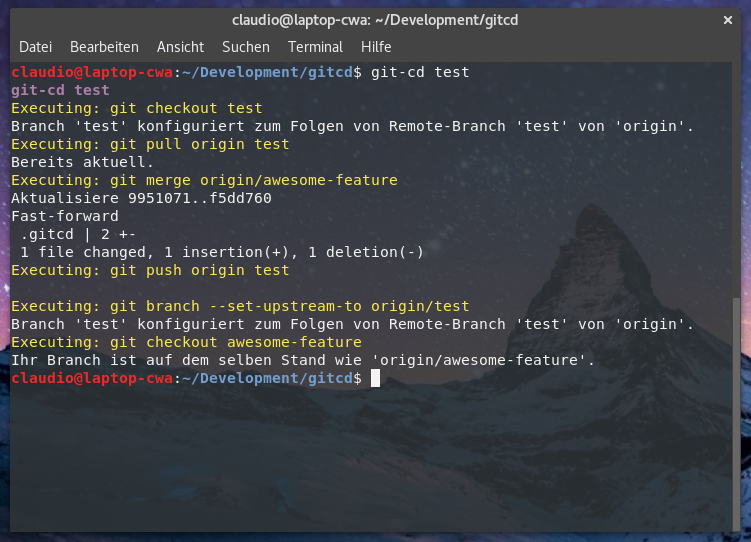 Pass your branch name where you want to merge code into while executing git-cd test. Let it empty if you don’t want to use that feature. At work, we have this for many repositories set to test. date means you generate a version number from a date scheme, you’ll be asked for the scheme later. As a date version scheme, you can pass any directive for http://strftime.org/. 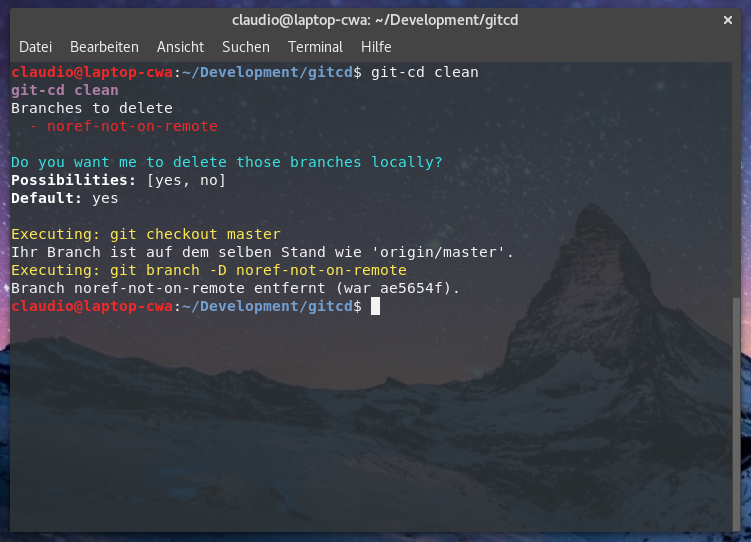 The tool is able to cleanup all local branches which doesn’t exist on remotes. This is done with the clean command. 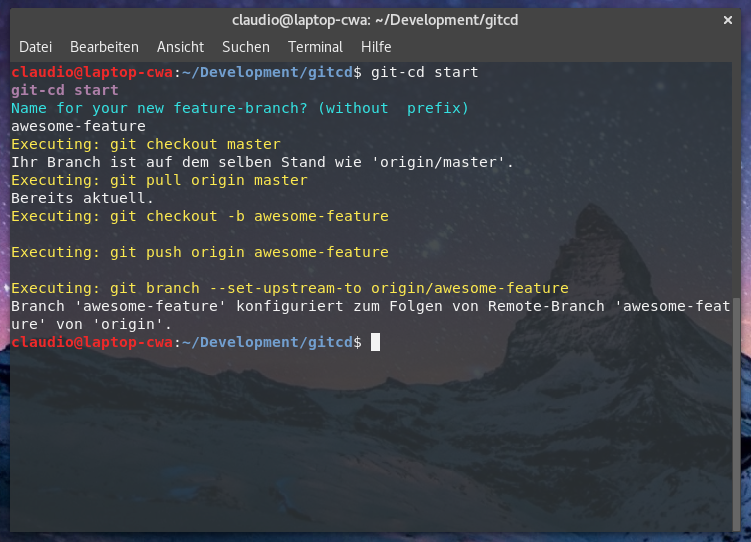 Starts a new feature branch from your master branch. If you don’t pass a branch name, you will be asked later. You might have a testing environment or want to run some integration test on a shared or common branch without the need to push out your feature with the next release. Therefore you can’t merge it into the master. That’s exactly why the git-cd test command exists. You might even have some dedicated tester checking the new feature on this specific branch. So to merge your new feature into your testing branch you call this command, if you don’t pass a branch name, your current feature branch will be merged. Opens a pull request to your master branch. If you don’t pass a branch name, your current branch will be taken. 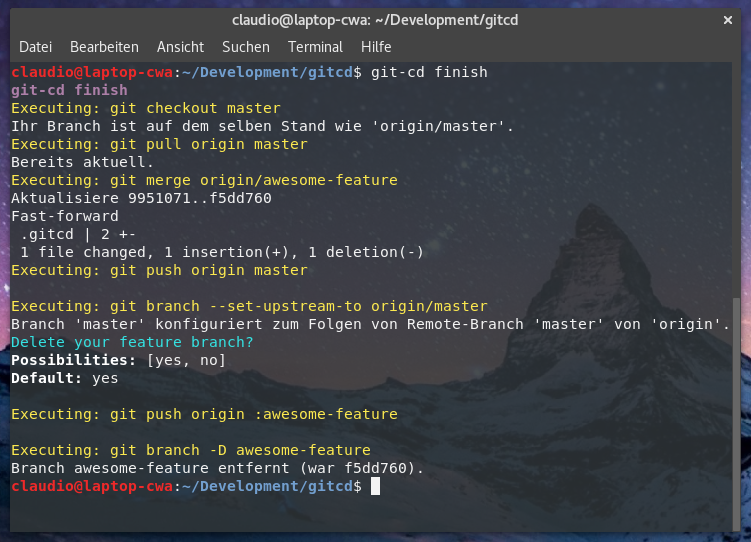 You can see the status of a pull request directly in the command line. If you don’t pass a branch name, your current branch will be taken. If your pull request got approved by a fellow developer and all your tests were running properly, you probably want to merge your feature into the master branch. If you don’t pass a branch name, your current branch will be taken. By now, your code is in the master branch. Personally, I always like to see what I am going to release by comparing the current branch (which is master after the finish) against the latest tag. If you don’t pass a branch or tag name, the latest tag will be taken. Now your feature is merged and you made sure you know the changes going out, you are ready to ship it. This command creates a new tag from the master branch and executes any command you’ve setup in the initialize command. If you discover any bugs, feel free to create an issue on GitHub or fork this repository and send us a pull request.